The article presents selected results of testing Ni-Cr-Re coatings deposited by means of HVOF supersonic spray. The substrate made of 16Mo3 chromium molybdenum boiler steel was sprayed with a powder material of Oerlikon Amdry 4535 80% Ni, 20% Cr, 20÷45 μm, to which 1% of metallic rhenium was added using the high energy milling method in a ball mill. The Rhenium is an alloying additive that improves the heat resistance of alloys, creep and high temperature oxidation resistance. Alloys with the addition of rhenium are widely used in the aerospace industry (nickel superalloys) and in power industry. Metallographic microscopic examinations, microhardness tests and surface profilometry were carried out. T. Chmielewski, D. Golański, Selected properties of Ti coatings deposited on ceramic AlN substrates by thermal spraying, Welding International, (2013), vol. 27 (8), 604-609, DOI:10.1080/09507116.2011.606146. K. Ferenc, P. Cegielski, T. Chmielewski, Technika Spawalnicza w Praktyce, Poradnik inżyniera, konstruktora i spawacza, Verlag Dashofer (2009). P. Siwek, T. Chmielewski, M. Chmielewski, Natryskiwanie łukowe powłok Fe-Al, Welding Technology Review (2018), vol. 90 (3), 62-67. M. Niedzielska, T. Chmielewski, Warunki natryskiwania HVOF powłoki Cr3C2-NiCr na stal 316L, Welding Technology Review (2017), vol. 89 (3), 46-50. 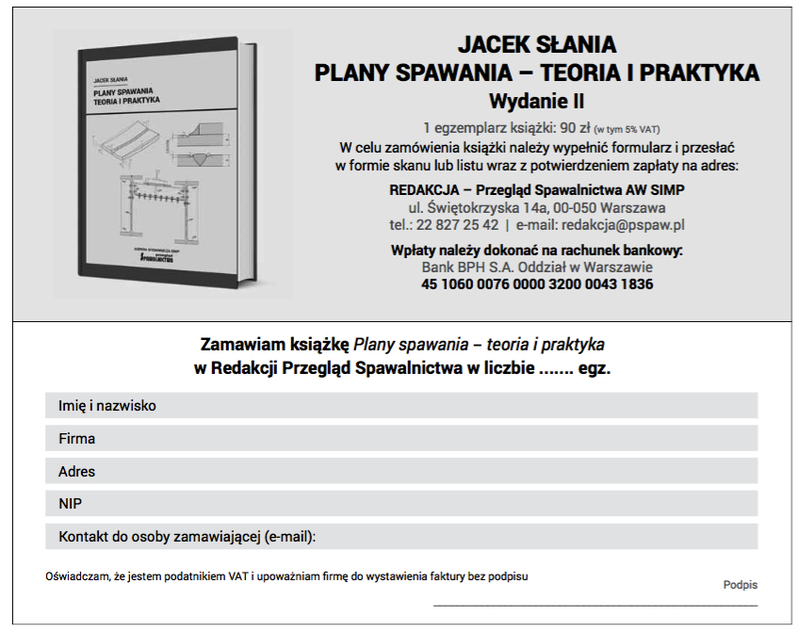 W. Żórawski, N. Radek N, Mikrostruktura i właściwości natryskiwanych naddźwiękowo powłok WC-12Co po obróbce elektroiskrowej, Welding Technology Review (2012), vol. 84 (9), 46-50. T. Chmielewski, Z. Sheng: Natryskiwanie powłok na bazie wybranych faz międzymetalicznych metodą High Efficiency Hypersonic Plasma Spraying, Prace Naukowe Politechniki Warszawskiej. Mechanika (2006), 49-58. G. Y. Koga, W. Wolf, R. Schulz, S. Savole, C. Bolfarini, C.S. Kiminami, W.J. Botta, Corrosion and wear properties of FeCrMnCoSi HVOF coatings, Surface and Coatings Technology (2019), 357, 993-1003, DOI: 10.1016/j.surfcoat.2018.10.101. S. Venetskii, Rhenium, Metallurgist (1971) vol. 15 (04), Russia. V. Kindrachuk, N. Wanderka, J. Banhart, D.Mukherij, D. Del Genovese, J. Rosler, Effect of rhenium addition on the microstructure of the superalloy Inconel 706, Acta Materialia (2008), vol. 56 (7), 1609-1618, DOI:10.1016/j.actamat.2007.12.010. L. Huang, X.F. Sun, H.R. Guan, Z.Q. Hu, Effect of rhenium addition on isothermal oxidation behavior of single-crystal Ni-based superalloy, Surface and Coatings Technology (2006), 200(24), 6863-6870, DOI:10.1016/j.surf- coat.2005.10.037. K. Tobota, T. Chmielewski, Napawanie laserowe powłok ochronnych na powierzchniach roboczych łopatek turbin parowych, Welding Technology Review (2016), vol. 88 (12), 38-42.